Ergonomic design and substantial 500 lbs. 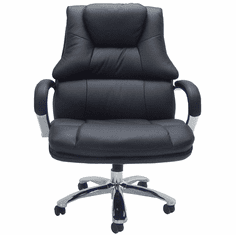 capacity construction make this an ideal choice for big and tall office seating. Users will certainly appreciate the breathable mesh back design that shapes to individual contousr. A dial adjustable padded support moves the lumbar area fore or aft to your ideal position. The flip up, softly padded armrests are another example of the quality comfort features of this incredible chair. Arms easily flip up and out of the way when necessary to provide ample room in tight workstations or for additional user space. * Superior 3/4" thick plywood seat pan. * Tough yet easy on the elbow urethane armrest pads. 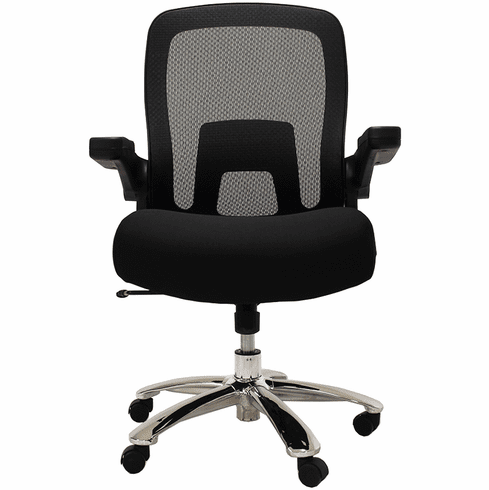 * 4" thick, multi-density foam padded seat for many hours of comfort. 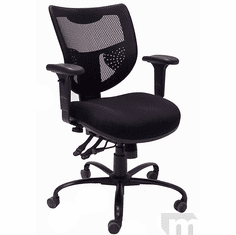 Standard functions include 360 degree swivel, gas lift seat height adjustment (19" to 23" seat height), and tilt/tension control with tilt lock function to lock chair in upright position while working at keyboard. 3-1/4" wide armrests are generously padded to be easy on the forearms. Rated for commercial office usage: 500 lbs. capacity 8 hours of use a day, up to 40 hours per week. Dual wheel carpet casters. Generously proportioned seat measures 23"W x 22"D x 19"-23"H. Back is 23"W x 25"H. 24" width between flip up armrests. Measures 30-1/2"W x 27"D x 43"-47"H overall. Ships unassembled. Shipping weight 65 lbs. All components exceed ANSI/BIFMA commercial use requirements. Meets CA fire foam approval. 5-Year Limited Warranty. PRICE INCLUDES SHIPPING! IN STOCK!